There's a very visible baby bump on the set of "How I Met Your Mother," but no one's paying it much attention. In a flashback scene for an upcoming episode, the ever-present narrator's memory is lapsing and he can't recall whether Lily ( Alyson Hannigan) was pregnant during the moment he's recounting. 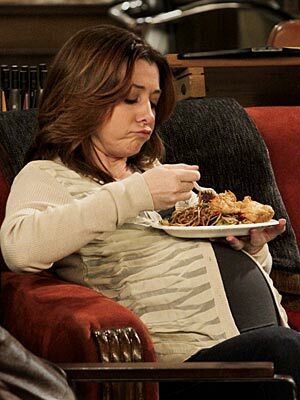 As Lily spars with Barney ( Neil Patrick Harris), her burgeoning belly remains unmentioned, serving simply as a resting spot for a plate of Chinese food. Now in its sixth season, the show is toying with the idea of employing a device much belabored in sitcom land: the addition of a baby. A due date is still unknown — and for some fans, that's OK. Much of the appeal of the CBS sitcom has centered on the interminable mystery of whom Ted Mosby ( Josh Radnor) will ultimately marry. But suspense can hold viewers' interest for only so long before it grows frustrating. Baby talk has loomed over the series for a while, with longtime couple Lily and Marshall ( Jason Segel) flirting with parenthood much of this season. And in fact, hints of an upcoming pregnancy stretch as far back as fall 2009, when, in a flash forward, Ted tells his kids how his friends quit smoking: Lily stopped once she started trying to get pregnant and Marshall quit when his son was born. Even if the stork doesn't drop by this season, it's fated to happen eventually. "I think we'd be super cute with a baby," Segel said during a set break. "We'd be like those people in the photos that come in picture frames." Still, the show's producers are proceeding with caution. "There's fear: Will it limit us? Will the show lose something?" admitted executive producer Craig Thomas. "However, the idea of opening up whole other stories is exciting." TV historian Tim Brooks plays down the notion that adding a small child is a catalyst for a show's demise. With 100-plus episodes of "How I Met Your Mother" under her belt, Hannigan said the timing is logical for TV's loving married couple. "I love that this show has always dealt with them as a real couple. Real couples at this point in their lives are either having babies or talking about having babies." Thomas acknowledged that they considered bringing in the baby storyline when Hannigan was pregnant in 2008. Hannigan, for one, is glad they opted against it. "It was too soon," she said. "Just the vast amount of time we spend in MacLaren's [Pub]… it would really affect the baby. Oh, and the show."